What exactly is PagerDuty? I’m not here to talk about our product, but want to let you know what we do so that you have some context. PagerDuty is a digital operations management platform which allows organizations to access data in real time, resolve and prevent business- impacting incidents and automate workflows with machine learning. Who has been on one of those phone calls where you are trying to troubleshoot an issue when something’s going wrong, and you’re trying to problem-solve with fellow human beings? Who really enjoyed that experience and wants to do it all the time? Incidents can be really tough, but there are ways to make them less stressful. That’s what we are talking about today. What exactly is a incident? Before we can respond to an incident though, we need to define what an incident actually is. It sounds silly, but if you’re not sure whether something’s an incident, you don’t know whether to respond to it. It’s critical that you have a specific definition of an incident for your organization. There is no right or wrong version of one. But you need to have one. And it needs to be clear, memorable, and widely shared. Here is PagerDuty’s definition of an incident. Yours might be different, and that’s OK. I just wanted to give you an idea of the kind of definition that can get you started. You want your definition to be simple, no more than a sentence, and easily understood by anyone. But you may notice that this is quite a broad definition. A typo technically fits this description. As does a full outage. Obviously these are very different scenarios. So we do have something else too. @mattstratton Discuss major incident, which requires coordination. More granularity can matter as well, SEV-1, SEV-2, etc. 50,000 responders receiving a total of 760 million notifications ▸ 60 million notifications during dinner hours ▸ 82 million notifications during evening hours ▸ 250 million notifications during sleeping hours ▸ 122 million notifications on weekends ▸ A total of 750,000 nights with sleep-interrupting notifications ▸ A total of 330,000 weekend days with interrupt notifications @mattstratton PagerDuty commissioned a study across over 10,000 companies over 100 different segments. The Four Agreements • Be Impeccable with Your Word • Don’t Take Anything Personally • Don’t Make Assumptions • Always Do Your Best @mattstratton Don Miguel Ruiz’s book, The Four Agreements, presents a code of personal conduct based on ancient Toltec wisdom to help remove self-limiting structures and beliefs. Each of the Four Agreements can help us understand a more mature, effective, and humane approach to incident response in our organizations. 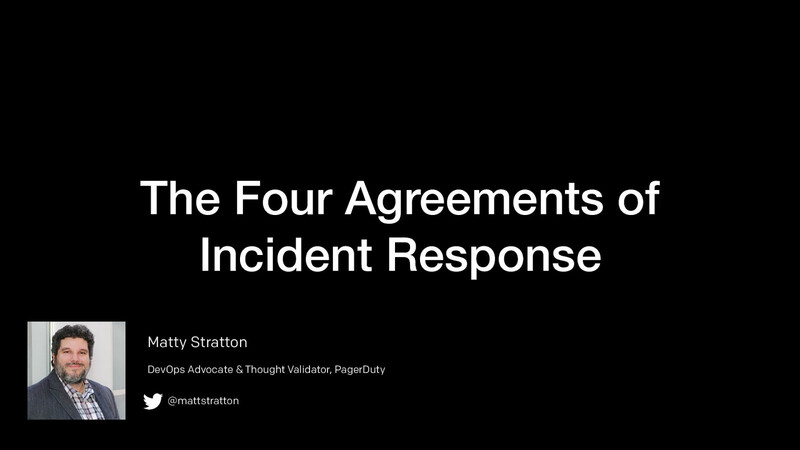 In this talk, I will address how the Agreements can be expressed as a modality for Incident Response. Using the Agreements, it is easier to understand modern approaches to resolving incidents as effectively as possible, and even help reduce burnout as well! Rich Adams !ic page 11:12 Officer URL APP 11:12 Paging Incident Commanders(s) Arup Chakrabarti has been paged. Paul Rechsteiner has been paged. Renee Lung has been paged. Use !ic responders to see who the team responders are. Incident triggered: https://example.pagerduty.com/incident/PD5I34R !ic page So how do we let humans trigger the process? We do it with a chat command, but don’t feel like that’s the only right way. I just wanted to demonstrate how we do it to give you an idea. You can do it however your want. Air horn, flashing light in the oﬃce, hire a mariachi band, etc. The point is, you want some way to trigger your response, that's fast, easy, and available to everyone. @mattstratton Anyone can do it. The cleaning staff walking past an information display that shows things are going pear-shaped. We don’t want to have to sit and figure out if things require response, because by the time we do so, they most definitely will. @mattstratton Don’t litigate severity during a call. What does this mean? @mattstratton Don't discuss incident severity during the call. If we can't decide between two, we always assume it's the higher severity and move on. Don't litigate severities during an incident. It's a waste of time. @mattstratton It’s critical to keep involving stakeholders in the process, giving them a way to stay up to date. At PagerDuty we have a separate Slack room just for incident updates. It's less noisy than our main response room, and gives succinct updates for folks who want it. This allows execs to stay in the loop, and also ask questions without affecting the main response. In our process, the Internal Liaison is responsible for monitoring and updating that channel. @mattstratton This means that during an incident, a lot of things change. And one of those things has to do with how we communicate. It doesn’t mean we can be jerks to each other. But we are focusing on our goal, which is to handle the situation in a way that limits damage and reduces recovery time and costs. National Incident Management System (NIMS) Coordinated Incident Management System (CIMS) Australasian Inter-Service Incident Management System (AIIMS) Gold-Silver-Bronze Command Structure (GSB) Incident Command System (ICS) ... and many other similar systems used in around the world. @mattstratton It's worth noting that even though our process is based on the US systems, NIMS and ICS, there are many similar systems in use all over the world. While many are also based on ICS, some were developed separately, yet offer many of the same features. I particularly like the UK system, simply because it has a role called the "Gold Commander", which just sounds like a Bond villain. When developing our process at PagerDuty, we looked at a few of the other systems in use around the world, and chose the bits we liked the most to add to our own system. There's also a book available from the US FEMA website, called "Comparative Emergency Management: Understanding Disaster Policies, Organizations, and Initiatives from Around the World" if you're interested in learning more about the systems in use. It compares the systems used by about 30 different countries. @mattstratton At the top of our process is someone called an Incident Commander. Let me tell you a little bit about the IC. @mattstratton This is a tricky one. The IC is the highest authority on the call, even outranking the CEO or other management. Make sure you get buy-in from management BEFORE or this will not go well for you. Don’t take this personally. @mattstratton Of course, sometimes you have to help people understand this new way of working. And it can be tricky. Especially with executives. @mattstratton When the executive is coming in and trying to take over, it’s quite simple. Let them take over. Say “Are you taking command of the call?” If they say “yes”, great. Most of the time, they won’t say anything and you can move along. @mattstratton This can make you feel pretty crappy. The implication is that people aren’t working as hard as they could. @mattstratton While this can sound really demotivating when it happens, stay professional. Don’t take it personally. Say “we are in the middle of resolving an incident. Please keep your comments to the end” or direct them to the appropriate communication channel/liason. Remember that your execs aren’t trying to make things worse - they are trying to help. Don’t take it personally. This background is blue. @r_adams Let's look at a quick example to show what I mean. I propose that this background is blue. Does everyone agree? (Point to about 5 different people in the room one by one and ask if they agree). See how long it’s taking us to reach consensus? Distributed consensus is hard, you’ll be there forever trying to agree on the proposed actions. Let's try it a different way though. I propose that this background is blue. Are there any strong objections? ... Hearing none, background is blue, let's proceed. @mattstratton One of the most essential terms in your toolkit is “Is there any STRONG objection?” We are optimizing for the 99%. This also prevents hindsight effect (“I knew that wouldn’t work”) as well as emphasing we are not looking for the most perfect solution. @mattstratton When we put in a lot of jargon (i.e., “Let’s get the IC on the RC and get some BLT’s for all the SME’s”) we add a lot of cognitive overload. This also can make newcomers feel excluded. Clear rather than concise. @mattstratton So now it’s time to assign tasks to help resolve an incident. We are going to tell our SME’s the things they need to do. How do we do this? @mattstratton A couple critical items here. Make sure tasks are assigned to specific people. And they need to be time-boxed. And definitely make sure they are acknowledged. Avoid bystander effect. “Can someone…” is deadly. Rachael, I’d like you to investigate the increased latency, try to find the cause. I’ll come back to you in 5 minutes. Understood. @mattstratton What’s different here? It’s a little more verbose than “Can someone”, but several important things happened in this exchange. @mattstratton It’s better to make the wrong decision than no decision at all. @mattstratton Wow, is that a controversial statement. But here’s the thing…making the wrong decision provides you with more information. Making no decision? We get stuck in analysis paralysis. @mattstratton Can get so many people on a call - it’s really expensive in terms of both money and effort. Super stressful for everyone. Way better to get people in when you need them but let them go. @mattstratton Do responders get tired? Do IC’s get tired? Of course we do. @mattstratton Handovers are encouraged. It’s quite easy to do - bring in the new person to shadow for a bit, and you just tell everyone what’s happening! @mattstratton Post-mortems not only should be blameless, but only useful if you actually learn from them. Don’t do them just to fill out a form. Write-only post-mortems are useless. @mattstratton Continous improvement! Quarterly, annually, whatever it is…make sure you’re asking the right questions. For example, at a certain point at pagerduty, everyone was paged on a critical incident. That works at a small size. But it doesn’t scale as the org gets bigger, etc. DON’T PANIC @r_adams Don’t panic. It elevates stress, and causes others to panic. It’ll end up hurting your incident response a lot more. @mattstratton It's OK to panic on the inside. We're only human after all. It's a natural reaction to panic in these sorts of situations a little bit. Everything about getting paged is designed to get adrenaline flowing. Loud pager sounds and so on. Just don't ever outwardly show panic, because it will cause others to do the same. Act calm, and others will follow suit. We trained with some ex-firefighters to learn about incident response, and something they mentioned stuck with me. They would often come to a house fire, and the owner would be historical “Oh my god, you have to help…”, etc. It's understandable of course, but they were actually hindering their progress. The firefighters would have to tell them, “This might be your first fire, it’s not ours”. Fire isn't an emergency to the fire department, it's routine. Those with experience will stay calm, and that can make the difference between a chaotic incident, and one that resolves smoothly. So don’t panic. View The Four Agreements of Incident Response. Don Miguel Ruiz’s book, The Four Agreements, presents a code of personal conduct based on ancient Toltec wisdom to help remove self-limiting structures and beliefs. Each of the Four Agreements can help us understand a more mature, effective, and humane approach to incident response in our organizations. In this talk, I will address how the Agreements can be expressed as a modality for Incident Response. Using the Agreements, it is easier to understand modern approaches to resolving incidents as effectively as possible, and even help reduce burnout as well!